Red sea fan species (Callophyllis spp.) are flattened, fan-shaped red algae with veinless, dichotomously-branched blades. Branch width and length vary between species, though such characteristics are generally not enough to accurately differentiate between species. Confirmation at even the genus level may require microscopic examination. See the AlgaeBase Callophyllis page for genus identification details, and see the AlgaeBase species page for more photos. ​Mature C. pinnata plants tend to be more than 10 cm tall, have end branch segments measuring 2-10 cm long, and have smooth margins. Red sea fan species mostly grow in the subtidal to depths of 20 m, though they may occasionally be found in the low intertidal. They are mostly perennial, and grow on rock, other algae (epiphytic), and animals (epizoic). They are found from northern Alaska to northern Mexico. C. pinnata is one of the more common species in the genus. 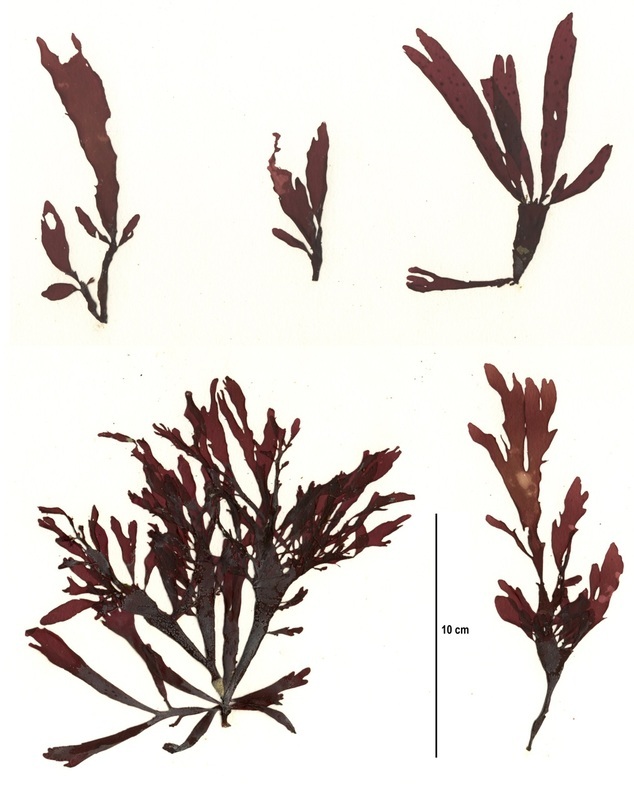 Callophyllis pinnata specimens from Calvert Island beaches; specimen collection number SCL 15375 in the UBC Herbarium Algae Database. Image courtesy of Sandra Lindstrom. Search the collection numbers in the database for further details on these specimens, or search this species for additional occurrences.